The Zinc Air cell isn’t rechargeable. For larger cells & batteries the IEC round /cylindrical cell designation is AR and square cross section AS, thus a 8.4V or 9V pack is 6AS4 and a 7.5V 90AH pack might be an 5AR40 as they usually are R40 (Flag Cell, #6) sized in a larger tub. 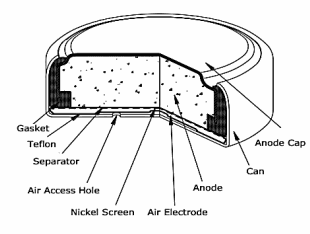 The electrodes are gelled zinc powder for the anode and catalysed carbon cathode with access to the hole for oxygen. The zinc anode is consumed to zinc oxide just as in a Silver Oxide battery. Electrolyte is Potassium Hydroxide (KOH) Exterior surfaces are Nickel. (Shown left is construction of a miniature Silver Oxide Button cell. If 3V or multiples of 3V are required then the Lithium primary coin cell might be more suitable. If the equipment or gadget is sealed or used intermittently for more than two weeks and about 1.4V is required then Alkaline or Silver Oxide (superior but more expensive and 1.55V nominal) is required as the Zinc Air cell self Discharges in 2 to 4 weeks. Other than the self discharge issue, it has the most similar voltage & discharge profile to the now banned Mercury cells..
Self discharges when activated, useful for up to weeks continious low current drain. 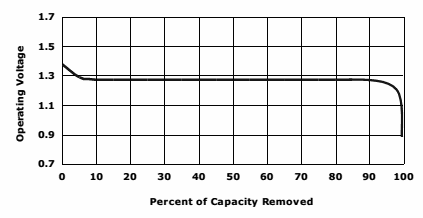 If 3V or multiples of 3V are required then the Lithium primary coin cell is superior. If the equipment or gadget is sealed or used intermittently for more than two weeks and about 1V to 1.6V is required then Alkaline or Silver Oxide (superior but more expensive) is better. Large batteries (about 9V 90AH) are used to power farmer’s electric fences (Fencers) and miniature 1.3V button types for hearing aids. It may be possible to regenerate large Zinc air cells based on a cassette/cartridge system.